As a leader, you have cultivated a style that is uniquely your own. As author and leadership expert Cash Keahey says, you are “the exception to the rule” that defines leadership. But it is still possible to see and learn from reflections of your own style in the lives of some of history’s greats. 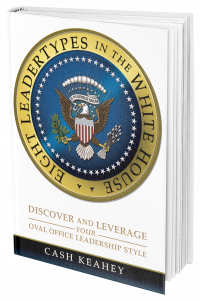 Keahey brings that vision into sharp focus in his timely new book about presidential leadership, Eight LeaderTypes in the White House: Discover and Leverage Your Oval Office Leadership Style. Profiling eight of American history’s greatest leaders, Cash looks at how the widely varying personalities of these presidents impacted their performance in the Oval Office, in each case leaving an indelible mark on the American presidency. The artfully constructed profiles—founded in the work of 120 presidential historians—and accompanying analyses, draw readers into the Oval Office as they identify with one or more of history’s monumental figures. Whether you’re a casual fan of American history, or an expert in the Myers-Briggs/Jungian personality theory that serves as the basis for the author’s proprietary LeaderTypes, you’ll come away with a new view of how personality impacts leadership on the world stage and in your own life. Harry Truman said, “In reading the lives of great men, I found that the first victory they won was over themselves…self-discipline with all of them came first.” Before you can manage others, you must manage yourself. My hope is that by reading this book and identifying with one or more of these eight presidents you can better leverage a strength, mitigate a weakness, reduce a blind spot, clarify your brand, live your values, be more authentic, and have more confidence in your capacity to lead. The leaders opposite each other could not have been more different personality-wise. They had totally different leadership styles: the ones on the left preferred introversion; the ones on the right, extraversion; the top four focused primarily on how they perceived their world; the bottom four, mostly on their judgments of the world; some focused on details, others context; four decided primarily with their head, four mostly with their heart—all due to their personality type, and all critical to leadership.